Let’s face it, we’ve all been there. Be it on a lazy Sunday or during a busy day at work, the possibilities are you have already ordered food to be delivered to your door using a mobile app or about to order. An enormously easy and hassle-free procedure, ordering food to be delivered via an app is a breeze: just a few clicks and your food are on its way. The benefits become even more obvious when thinking about the old-traditional way of ordering: using a printout of the menu and having a time-consuming phone call with the restaurant. No wonder people love food delivery app! According to research, 81 % of Smartphone users use a mobile app to search their nearby restaurants. 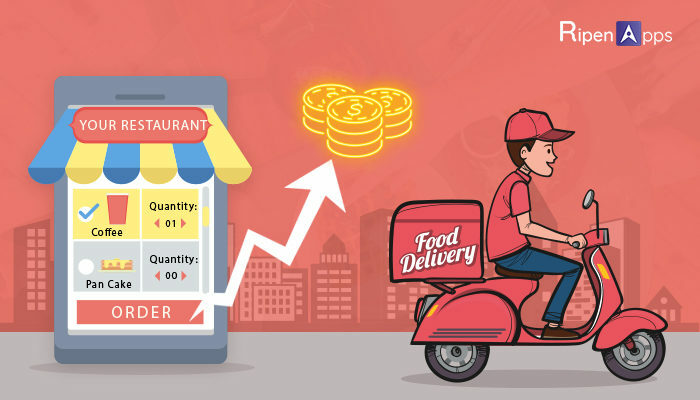 Hence if you have a strategy to harness the power of mobile app with finely-designed user engagement marketing strategy & want to double the revenue of food delivery app, then undoubtedly this blog will help diverse business startups to know about the major revenue factors for a food delivery app. Now before we move on further, let’s get some stats on the board to show how the food delivery app has already got the attention of food lovers. According to one of the surveys, it has been found that 81% of Smartphone users use a mobile app to search for their nearby restaurants. Among 20% of people in the United States use food delivery apps once in a week to have their favorite cuisine from the preferred restaurants. 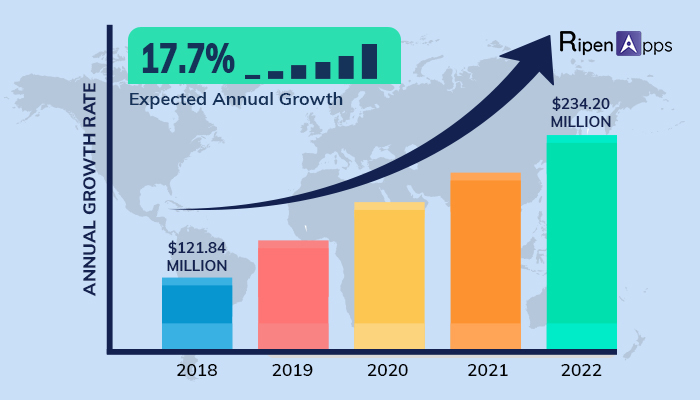 Growth Rate of Food App Development Company: The growth rate of food app development companies is expected to grow over $250.43 billion globally by the year 2022 at a single digit CAGR via predicted period. Revenue in Food Delivery: At the end of 2018, the revenue is expected to $121.848 million. The Annual Growth from 2018 to 2022: It is predicted to show an annual growth rate of 17.7% resulting in the market volume of $234.206 million in the year 2022. Food delivery apps have simplified the process of online delivery of meals from local restaurants. Online food delivery apps permit users to order their favorite food from their favorite restaurants with a single tap on the mobile. If we talk about the process of food delivery via mobile app, then it’s not a lie to say that ease and comfort have been increased after inclusion of mobile apps in food & restaurants industry. Now, customers don’t need to make a call at the restaurants and then go to the restaurants to pick the order. They can simply place their order via a tap and customer also enables to look for their favorite restaurants, view menus, place orders, live tracking of the food, and pay. If any business owner or startups are planning to harness the power of mobile app development in food & restaurants industry and wants to earn more, then we have mentioned some revenue generating factors on which you have to focus on. Before moving further, let’s consider some food delivery platforms like Foodpanda, GrubHub or Zomato etc. And see what result they have attained. Zomato hit $100m annual revenue rate this month. In September 2018, Zomato acquired Bengaluru-based food e-marketplace TongueStun Food for about $18 million in a cash and stock deal. How have these companies attained such success? Let’s think about what sources of revenue the biggest food delivery platforms have and learn how food delivery apps make a profit. Peak hour deliveries are a powerful way to make more money out of food delivery apps & helps in generating more revenues out of food app business. This revenue generation approach involves a delivery surcharge during peak hours. Like if you are hungry at night and craving for food, and then you can easily order the food at your place and get it with few extra charges. For example, Zomato gets surge pricing during dinner. At peak hours, Zomato limits menus & locations and charges an extra fee to make them available. If a restaurant doesn’t have its own delivery team, food delivery apps can take care of delivery with the delivery charges. Delivery fees can be a profit of the order price or a flat charge depending on distance. This technique of charging delivery fees based on distance to customers for each delivery & commission charged to restaurants owners mainly 10 % of the order price can also make money. Since delivery charges are the main revenue generation source of all food delivery apps. The millennial market is inclining market. The engagement of this age group towards Smartphones makes them key target audience & knowing the right target audience is beneficial in terms of generating high revenue through business. These people are office goers who have a busy & hectic schedule. A fully-featured food delivery app can make their lives easy by delivering them fresh food on time. This could be the jackpot for the food delivery app owners if they can offer this age with- a clear menu display along with price, easy & quick navigation to click & order, display picture that depicts what their customer may expect. Provide mouth-watering food pictures, the better your picture looks, and the more hungry they become. And this will lead towards revenue generation. One more factor to generate more revenues through food delivery apps is a commission percentage. Online Food delivery apps can collaborate with the restaurants on predefined commission charges based on the order size, a distance of delivery’s place etc. Let’s take an example of one of the food delivery platform, Deliveroo. Charging commission to restaurants has increased its revenue by 20 % to 25 % a month for the last three years. Hence commission charging can boost the revenue of food delivery apps. This is an absolute necessity for your Fast Food business. As GPS has increased mind-boggling prominence, Location-based services are what you can serve to mobile users. With mobile apps having a physical proximity sensor, empowers to tempt customers with deals through pop-up messages in a split second. Imagine you are going by a Pizza plaza and you get a deal from them informing about an irresistible deal just for you that will be applicable for just next 60 minutes. Will you not be energized? This feature of GPS tracking can also help you to enhance your food business revenue by double. Do you understand why social evidence works? The social media incorporation in your food app can let you win word of mouth and positive reviews. In the world full of social networking apps, everyone loves to share what they have in their food. Whether it is Facebook or Instagram, your customer will click a picture, tag your service and give you ratings and this will boost your brand name as well as engages more customers. Moreover, incorporation of social media with your app is absolutely complex. Apps don’t easily provide URLs that can be readily shared in social media. So must provide options to share information about app, menu, review or invitations etc. On weekend’s night when people look for a hot dine to enjoy restaurants can use a push notification. This tempts hungry customers. Location-based notification works brilliantly in this situation. Secondly, personalized notifications that engage users use app analytics to find out customers preferences and customizes notifications accordingly. Online Food delivery app development is a promising business idea for making more money as evidenced by the success of famous apps Zomato or Foodpanda. If you are about to enter in the food & restaurants industry with your startups’ idea and want to know about the areas where you can make more money through your food delivery apps then apply above-mentioned factors on your business and multiply your ROI. Still, have any query? Contact us at info@ripenapps.com and our experts can you detailed information.